There are tons of baby carriers on the market today! With so many choices what do you choose and why? 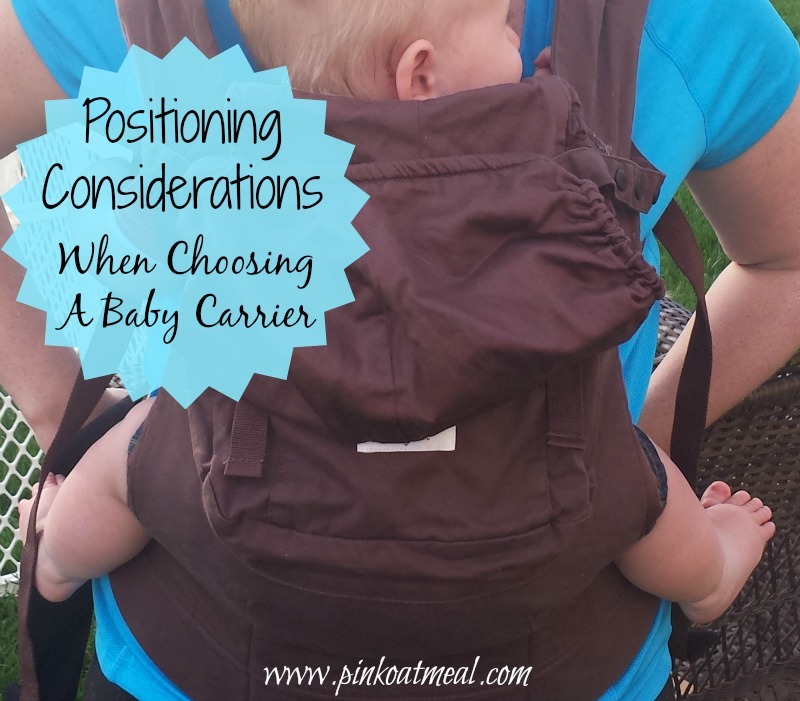 Here are some of my thoughts on what to look for when it comes to positioning and selecting a baby carrier. When a baby is in the womb they are carried in the fetal position. The fetal position means that knees and hips are tucked up (bent/flexed) towards the baby’s body. The baby’s back is bent in a C shaped (kyphosis) towards the baby’s legs. When a baby is born they don’t automatically straighten out. They maintain fetal position posturing. It takes several months before the baby’s joints stretch out and straighten out. As baby grows and gains strength to hold their head up they develop the proper spinal neck curve (tummy time is important). When your baby starts to crawl this contributes to proper spinal alignment. The spinal curves give the optimal structure for movement, weight-bearing activities, and proper neurological development. When a baby is first born their cartilage in their hips has not fully hardened. A Baby’s hips are also quite shallow and the socket isn’t fully developed. With proper hip positioning of the baby’s hips, meaning that the ball is putting pressure into the socket (pelvis area) the baby’s hips will become deeper and more stable as they develop. Putting your baby in a position that results in challenging their stability too much or causes there back to curve too much or too little can be detrimental to their development. Placing your baby in an “M” position or frog position is good positioning for carrying a baby. This position consists of the baby’s bottom lower than their knees, their hips spread out over 90 degrees with support on the thighs and their knees flexed. A baby’s spine starts out in kyphosis (C-shape) and doesn’t fully complete the transition to an “S” shape until they are 12-18 months old. Putting a baby in a position where they are are suspended and hanging without proper support at the hips or legs results in the baby’s spine being stretched into a straight line against it’s natural shape. Placing your baby in a carrier that supports the “M” position and/or frog position allows for optimal and developmentally appropriate positioning of the baby’s spine. The most ideal position for a baby’s hips is one that is most resembles the fetal position for optimal alignment of baby’s hips. That is when baby’s legs fall to the side naturally with thighs and hips supported and hip and knees in a flexed position. Not only do you have to think about positioning of your baby but think about the importance of positioning for you. Choosing a carrier that holds the baby nice and close to you provides less stress on your back. Make sure that you have the weight of the carrier evenly distributed and straps and/or wrap properly adjusted. I will be honest, I can not find any research stating that hip dysplasia is caused by baby carriers. Yet taking into consideration positioning I’ve still opted for baby carriers that promote the positioning I’ve talked about it above. I actually have two different baby carriers and I use them differently. I wouldn’t say that I had a baby that took to carriers right away and still to this day prefers to be crawling on his own. However, he can’t crawl everywhere and at times I need a hands-free way to be on the go with him in tow. The Ergo and Moby are what worked for us and also promoted appropriate positioning while being carried/worn. The Moby (looks like this) was the first carrier that I used with my little man. I loved all the different positions that I could wrap my baby in. My favorite position was the newborn hug hold. I also loved the fact that the Moby provided a swaddling/calming experience for my baby. It wasn’t nearly as overwhelming as I thought to wrap it plus there were tons of videos on YouTube on how to do it. I could do it quite quickly. It offered the optimal tummy to tummy positioning for a newborn as well as proper positioning for the spine and hips. I still throw this on around the house when my little man wants to be carried but I need to get something done. The Ergo (looks like this)is my in the car carrier. When I say that I mean it goes everywhere we go. It provides the optimal positioning for my little man. It’s easy for me to throw on. For the most part we have been using it with my little guy facing me. Now that my little guy has become VERY curious and quite social he has done some protesting to having to look at me all the time…tear. I like that I can easily put him in the Ergo and get him on my back after practicing a few times at home. I love that he still has optimal positioning while on my back and he loves that he can see and “flirt” with everyone. Not all babies like every baby carrier equally. Even though you may have found a carrier that puts the baby in optimal positioning it doesn’t mean that your baby will like it. You may have to try a few to get one that makes you and your baby happy. Make sure to check safety instructions /precautions on your choice of baby carrier and follow instructions as directed. Consider the time of the year that you plan to wear the carrier and the different fabric options. Take into consideration your body. Make sure that you wear your baby in a way that doesn’t cause you pain or additional strain. What baby carriers worked for you? Did this post change your thoughts on your current baby carrier? Thank you for this helpful post! I was wondering if you might list any other carriers that you consider similar to the Ergo in terms of positioning quality? Are there any brands that you would not recommend? The Moby wrap K’tan or Becco all provide good alignment when properly wrapped. One of the more popular brands that is a “crotch dangler” is Baby Bjorn. Lillebaby and Tula are two other commonly available brand buckle carriers that provide similar positioning as the Ergo. 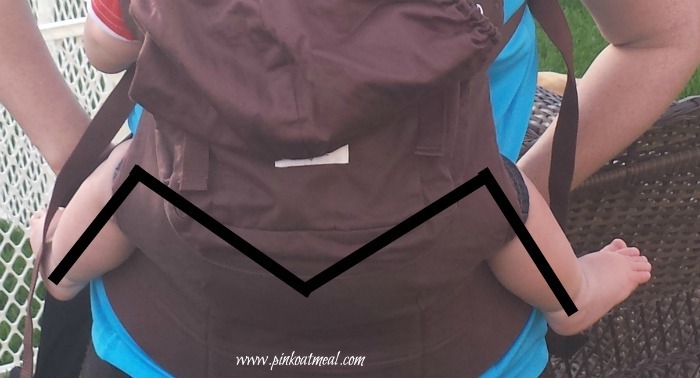 Thank you to Pink Oatmeal for sharing information about safe babywearing! What a great page you have! I love what you are doing! I too have the Ergo 360. My son is a little over 4 months. He hates it facing me, but is very content when facing away from me to look at everything. He has very good head and trunk control. I noticed you mentioned that he still faces you in the carrier. Is there a disadvantage to having him face away from me while in the carrier? My little guy still faced me because they didn’t have the 360’s available when my first one was born. I honestly don’t know a lot about the Ergo 360’s but it looks like they position the baby in a better position than the carriers that just have baby dangling! I know I’d love to try one sometime with my 2nd!